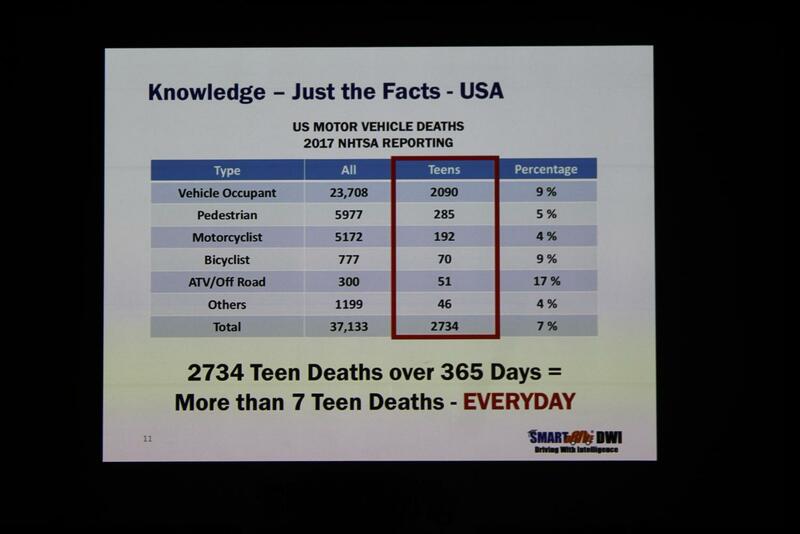 A slide from the SmartDrive assembly highlights the staggering number of teens who die in car crashes. Several days ago, a classmate burst into class, complaining how wrecked her car was—she’d just gotten into an accident because a car had cut in front of her without using their signal. Another classmate piped up. “That’s called an aggressive driver,” she said. She always thinks about that when she drives now, thanks to the SmartDrive assembly the entire student body attended on Feb. 27. The SmartDrive assembly was sponsored by the Students Against Destructive Driving club, more commonly known as SADD. SADD’s members share a common goal: decrease (or even eliminate) unsafe driving among Padua students. While your mind may jump to drunk driving, their focus extends far beyond that. Fallon Grace, a junior who has been a member of SADD all through her time at Padua, explains that it was something as small as a seatbelt that got her to join the club freshman year. Grace was one of the SADD members involved in organizing the SmartDrive assembly, and introduced the speaker onstage. In order to fund this “key step” of safe driving education, SADD sells candy grams during the Christmas and Valentine’s Day seasons. Molly Grant, a freshman, also helped introduce the SmartDrive speaker, and participated in the selling of candy grams. More personally, she hopes that the lessons students learn from SADD and the SmartDrive assembly could help keep people like her little sister safe. She hopes the assembly she was involved in organizing will help achieve her goal. Although students will not remember all that was said during that assembly, perhaps enough will retain the information that will keep them safe on the road. Just like the student who always notices aggressive drivers, junior Madalyn Lambe now thinks more about the possible consequences of her driving.